This morning I had the pleasure of meeting up with Nicola White, who found me through this blog when googling to see what other Leverhulme Artists in Residence have been up to. Nicola started as the Leverhulme Trust writer in residence at the school of Nursing Studies, University of Edinburgh in March. She came across to the Forum and we had a cup of tea out on the roof garden and talked about how our residencies had come about, what we’d planned to do, and what we’ve actually ended up doing. It was very reassuring to find that similar themes were coming up- timekeeping, commuting, the intricacies of working in a space as an ‘alien’. I was particularly intrigued to learn about the anatomy museum, where she plans to hold some workshops for staff, and hope to visit it with Nicola later in the month. It was also enjoyable to look at the space I’ve been working in for the last ten months through a fresh pair of eyes. Talking with Nicola was a sharp reminder that I’ve been half writing these blog posts but not finishing and posting them for the past couple of months. They all exist in note form, so now I’m based in Edinburgh full time for the rest of the month I’ll be able to go back and flesh out the skeletons. Outside the office window right now, Edinburgh is putting the finishing touches to the restructuring of the streets, squares, buildings and railings to turn into one giant festival. 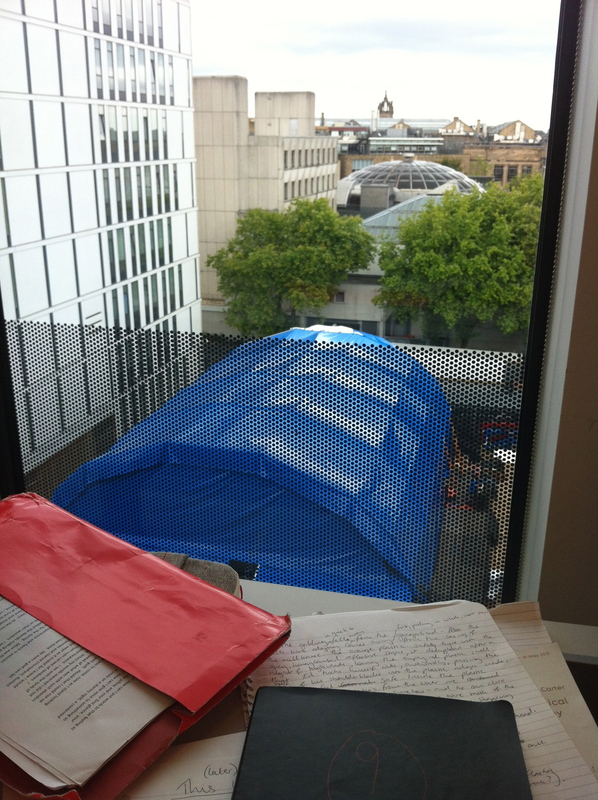 My main view from this desk is of the BBC zone, which looks to be more or less in place after last night’s stirling efforts to get the blue tarp on. My walk into work takes me across the meadows and past the Assembly-take-over of George Square gardens. Going to yoga takes me past the Gilded Ballon at the Teviot and the E4 Udderbelly. Currently everything is in post-construction; the crowds should start up at the end of the week when the jamboreeing begins. 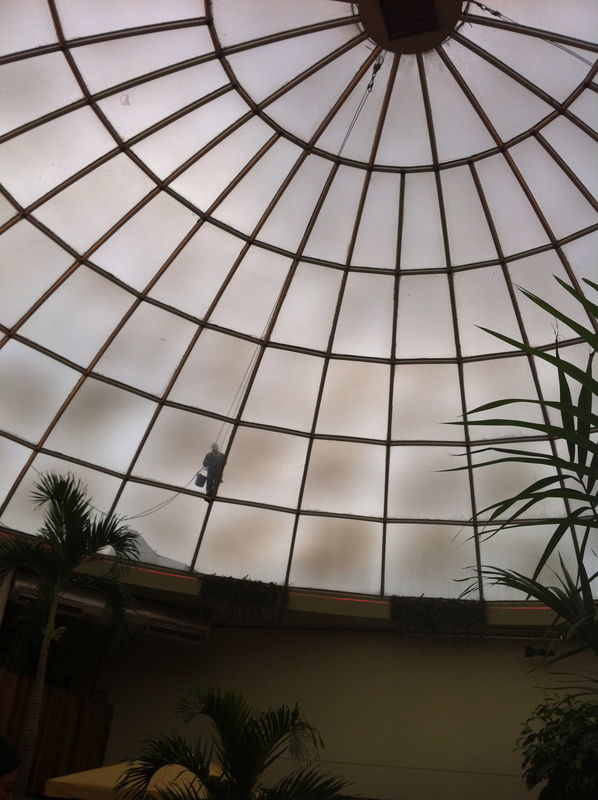 I can see men in hardhats abseilling around the outside of the Pleasance Dome, so this afternoon I went into the dome to have a look at them from a different perspective. About half four, the BBC started soundchecking. Which meant that a disembodied voice would float through the window at random times, repeating numbers in disjointed rhythms rather like a Gertrude Stein poem. While this was happening, I’d been experimenting with the Freedom software, on the suggestion of another writer, in order to get some black marks on the white screen without the continual distraction of email, Facebook, Twitter, and LOL cats. I was listening to Alisha’s Attic on full volume on my headphones and had become entirely absorbed in writing up about four months worth of notes on Ada and GIL from my last notebook (new one started this morning). When this deep male voice said ‘Hello’ then started counting up ‘One Two One, One Two, One Two Three’, for a disconcerting second I thought I was hallucinating. Am keeping the metaphorical jury out on Freedom for the time being; I found it frustrating, but had an exceptionally productive two hours writing. It’s a free trail for five goes, so I’ll see how the rest of the week progresses with it.